Getting to know the city is best achieved on foot, where you can truly experience what makes Philly such a great place to live. From bright lights to cozy historic streets, Philadelphia boasts more than 134 square miles of walkable terrain. Getting to know the city is best achieved on foot, where you can truly experience the colors, smells, and local flair that make Philly such a great place to live. What you’ll soon find is that walking is much more than a means to an end. Dr. Andrew Weil, the proclaimed wellness guru, notes that walking is the best exercise there is, as anyone can get a great workout without any skill or practice. Walking lowers your risk of chronic health problems and has the added impact of improving your mood. Combining exercise and the adventure of exploring Philadelphia is a foolproof path to a healthier lifestyle, and you can start by embarking on these routes. Stroll the hallowed haunts of colonial Philadelphia and open your eyes to the charm of the birthplace of America. Start at Market and 6th streets, and head south down the green malls for views of Independence Hall and the stoic Liberty Bell. Turn east on Chestnut and weave your way through Library Street to explore the narrow, cobbled streets of Old City. Head north on 2nd Street, crossing Market, and check out Christ Church, where you may catch a glimpse of Benjamin Franklin’s ghost — his grave is a few blocks away! Turn right down Elfreth’s Alley, America’s oldest inhabited residential street. Once your colonial dreams are realized, head south again and take a right on Arch St. walking west, stop by the Betsy Ross House, the birthplace of the American flag, and continue along Arch to see Ben Franklin’s tomb. At the National Constitution Center, head north on 6th to Franklin Square, where you can munch on some delicious burgers next to the park’s historic fountain. At 1.5 miles, this family-friendly route takes less than an hour but transports you back to over 250 years ago. For a route that’s scenic and takes you through the heart of the city, start at Love Park in Center City. Head down the Ben Franklin Parkway, keeping the Philadelphia Museum of Art in sight. After stretching your legs with a run up and down the Museum’s “Rocky Steps,” walk north along Kelly Drive and tromp past Boathouse Row. Turn around at the sculpture of Thorfinn Karlsefni, and head back south along Kelly Drive. 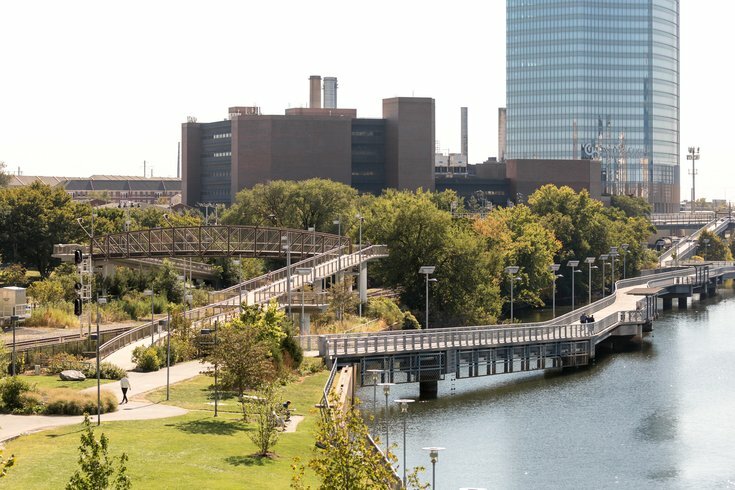 Turn right at the Waterworks Drive to connect with Schuylkill River Trail, where you’ll enjoy sweeping views of the skyline and make your exit point anywhere you’d like within the city. If you follow the path to South Street, the route in total will earn you a hearty 3.8 miles. Taking a stroll through Northern Liberties and Fishtown will introduce you to the changing face of Philadelphia and open your eyes to the new shopping and nightlife that is yours for the taking. Start at the corner of 2nd and Brown in Northern Liberties and walk north along 2nd, exploring the local eateries and specialty stores and boutiques. Turn right on Girard Ave. and head east until you reach Frankford Ave.
At the corner of Frankford and Girard, you’ll find bars, restaurants and plenty to do. Continue north on Frankford Ave until it intersects with East York Street, where you can retrace your steps or take the Market-Frankford Line to explore other routes in Center City, and you’ve clocked 1.7 miles. For a beautiful stroll through West Philadelphia, start on the corner of Baltimore Avenue and 50th Street and head east along Baltimore. Enjoy the colorful houses, old- growth trees, and outdoor cafe spots. Turn left on 46th Street for a quiet shortcut off bustling Baltimore Ave, and turn right on Larchwood and right again on 44th Street. End your walk in Clark Park at the corner of Kingsessing Ave and South 43rd, hanging out in the sun and relaxing after a leisurely mile waltz. For a more challenging route, take advantage of Philadelphia’s expansive Fairmount Park. Start at the Shofuso Japanese House and Garden, and enjoy the tranquil Japanese landscaping. Head north along Horticultural Drive, cut through to the Centennial Arboretum of the Fairmount Park Horticulture Center, and veer right to find Belmont Mansion Drive. Stay along this road across Montgomery Drive and enjoy exquisite views as you take in the beautiful city skyline at Belmont Plateau. Turn right on South Chamounix Drive and continue until the roundabout at the end of the street, where you’ll enjoy greenery and views of the horses at the Chamounix Equestrian Center. Walk back along Chamounix and turn left on Belmont Ave., following it south all the way down to Lansdowne Drive where you will turn left to return to the Shofuso Japanese House and Garden. At roughly 5 miles, this beautiful hike, dotted with many cultural landmarks, will have you well exercised. Walking is not only a great way to explore the city but encourages a healthier and more active lifestyle. These scenic routes will set you up for a lifetime of exciting walking both in Philadelphia and around the globe.